I've been collecting puzzles for over 10 years now, and I've lost count how many countries I have puzzles from. But one thing I know for certain: up until now, I didn't have any puzzle from Colombia. 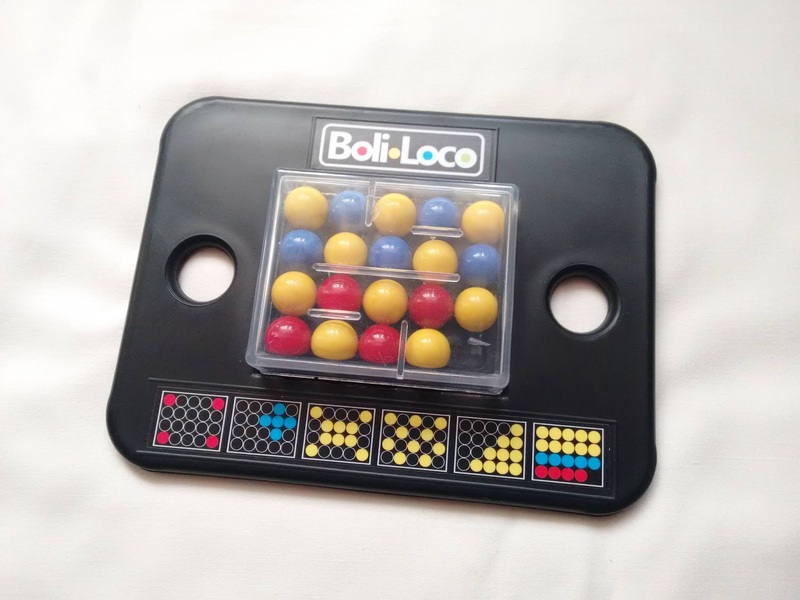 Thanks to Nelson Robayo, who created the Boli-Loco puzzle, I can now add Colombia to the countries where I have puzzles from. 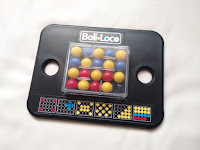 The Boli-Loco puzzle is a very clever design made with 19 marbles in three different colors (yellow, blue and red - the Colombian flag colors). 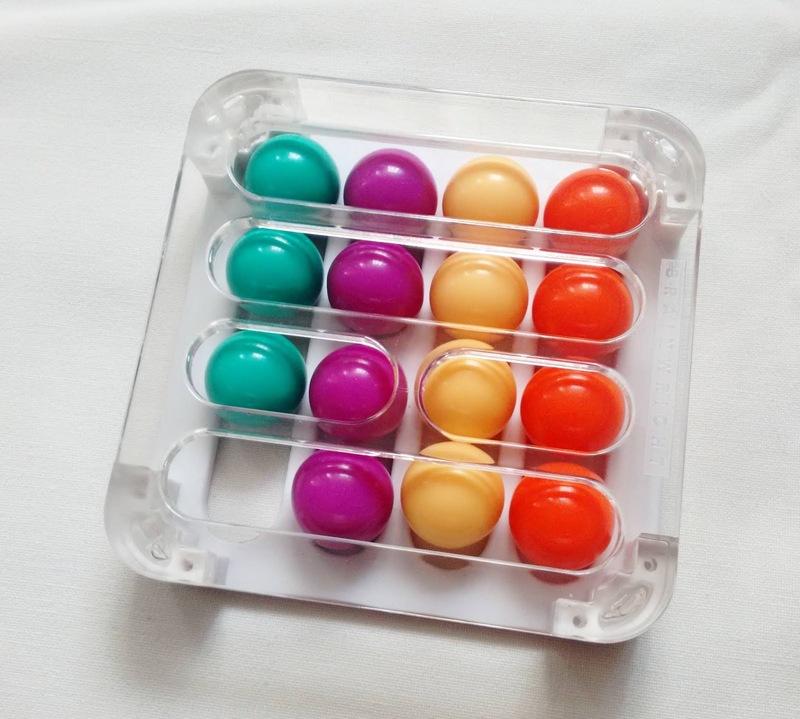 The marbles are enclosed in a transparent box with notches on the cover that make it some sort of a labyrinth. 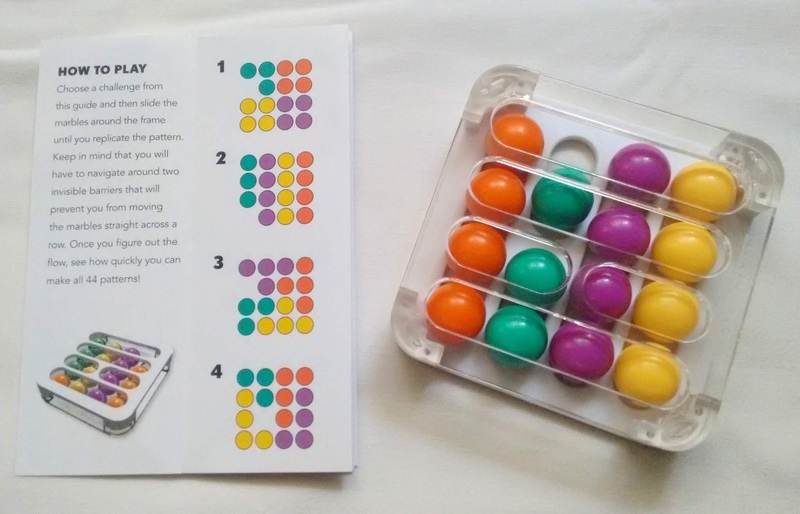 You turn the puzzle from side to side, up and down, so that the marbles navigate the labyrinth and make the patterns you see on the bottom of the puzzle. There are six different patterns to solve, but as with any pattern puzzles, you can most certainly create your own designs, your imagination being the limit. 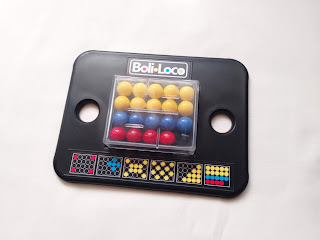 What capture my attention in the Boli-Loco puzzle right away was the patterns you can make with the marbles. Puzzles that allow me to use my creative side are always a must-have for me, and this one is no exception. I loved it from the start. The patterns presented all have various ways to solve except for the last one, which as you can see, you have to make the Colombian flag. 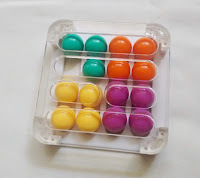 The other patterns can have the marbles anywhere except for the colors marked on the challenge. For example, the pattern with the blue cross (above left). You only need to worry about the position of the blue marbles. The other colors are not important, which makes the first five challenges easier than the last one. 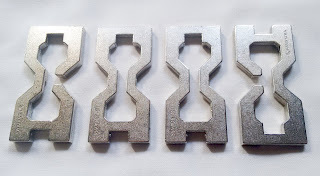 From the patterns presented, I would say they are in sequential order from left to right, easy to difficult. Making the Colombian flag was definitely the hardest one to solve. The Boli-Loco puzzle was a pleasant surprise, even more so because I didn't know the designer. It's a great design with an original and interesting concept, perfect for creative minds. Be sure to check back soon, since I have another puzzle from the same designer, which I'll be reviewing soon. 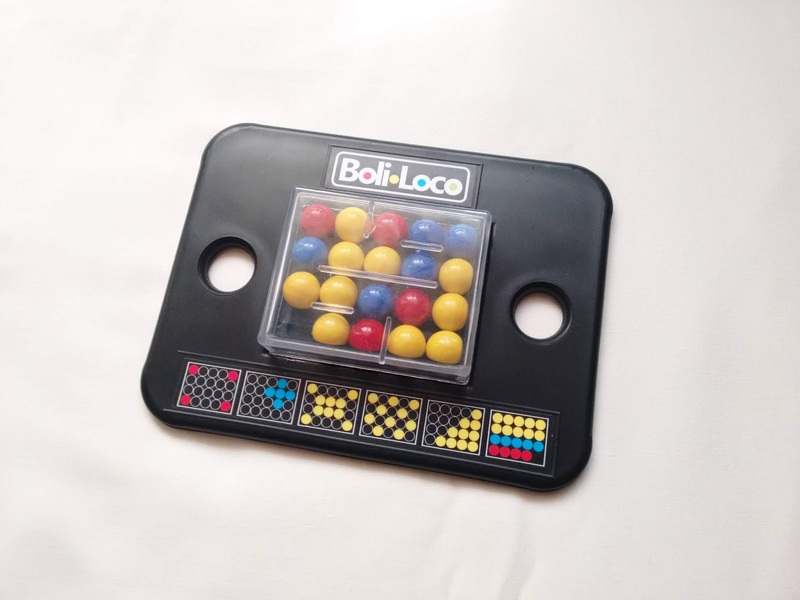 Availability: The Boli-Loco puzzle is available from PuzzleMaster for just $15.99. Check out more designs from Nelson Robayo. If packing puzzles weren't already difficult to solve, Jean Claude Constantin makes them even more challenging by always adding a twist. After all, we like challenging puzzles, don't we? My recent addition to this ever-growing collection of difficult puzzles is called Nimm 2. The name indicates that there may be a first Nimm, but in reality Nimm in German means "take", so the name can be translated as "Take 2". Read more and you'll understand the meaning. This is a nice small puzzle, measuring only 8cm x 8cm (3.2"). 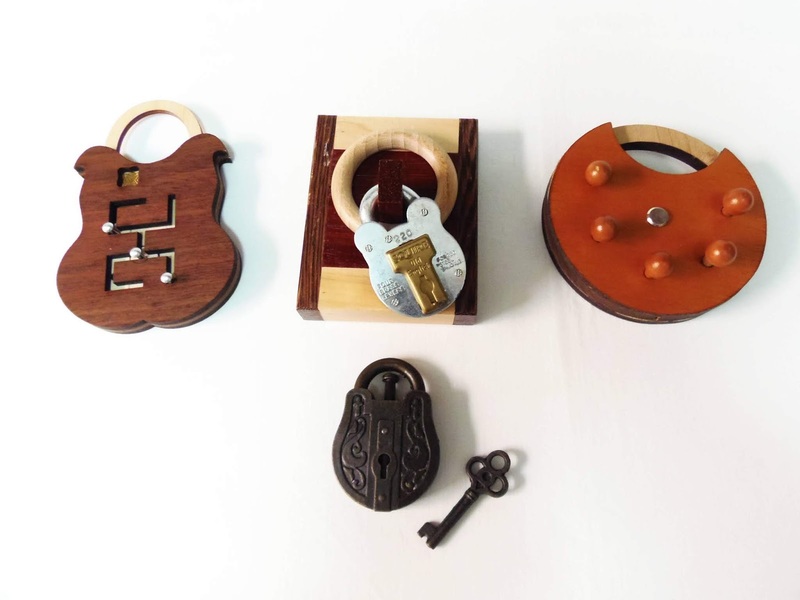 It is made from laser-cut wood, so the price is more affordable. There are 7 pieces, but they can be divided by two groups: one is a group of three trominos and the other a group of four tetrominos. Each piece has one or two screws attached to it, which makes for an interesting design. The idea is to have two screws in every row (vertical and horizontal). Diagonals don't count. It sounds simple enough, but believe me, this is a fiendish one to solve. As you can imagine, this is quite a difficult puzzle to solve. It's rated as a level 8/10, but I reckon it's possibly even more than that. I'm yet to find the solution, which might be a unique configuration, and thus explaining why it's so challenging. Nimm 2 by Constantin is a hell of a challenge. If you like this type of puzzles, you're in for a treat, because it'll keep you busy for a while. I liked the originality of the design. It's different from any packing puzzle I've tried before. Availability: The Nimm 2 puzzle is available at PuzzleMaster for $23.99 CAD. You can also check out other cool puzzles by the prolific puzzle designer Jean Claude Constantin. Which company/craftsman makes the most beautiful puzzles? - In my endless pursuit to answer this question, this time I will focus on one of today's most prolific puzzle designers out there - and my favorite - Jean Claude Constantin. 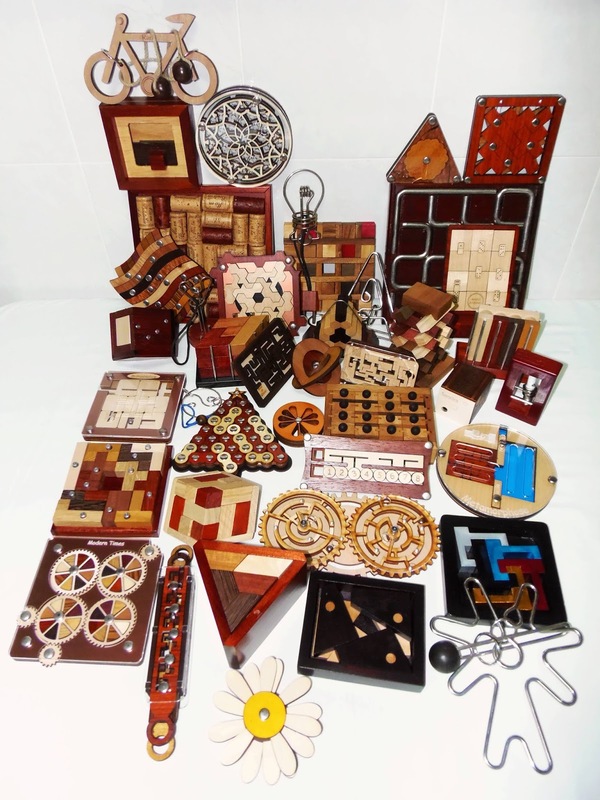 The name suggests a French origin, but Constantin is, in fact, from Nuremberg, Germany, where he produces in his shop over 70 new designs each year; and having been a puzzle designer for so long, imagine the total number of different puzzles he's been able to make so far. 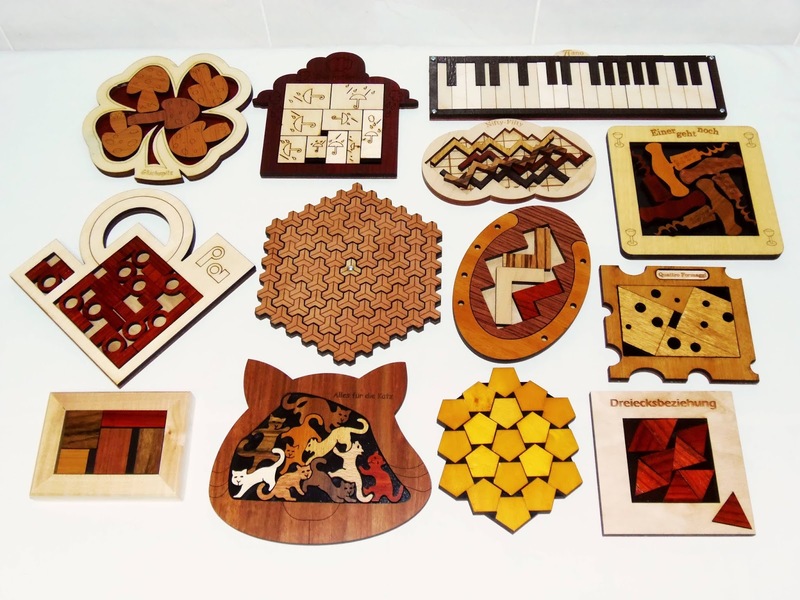 I currently own about 100 of his puzzles, so I can only dream of having, one day, all of his puzzles...and at the current rate he's making them, it's an almost impossible feat. Anyone that's familiar with Constantin's puzzles knows what characterizes them, what makes them so appealing to puzzlers and collectors alike. Any seasoned puzzler can spot a Constantin puzzle quite easily, as his designs always feature something new and clever in their concept. Their presentation is very well thought-out and elegant, and despite his materials often not being top-notch (laser-cut plywood), you can always count on a high quality finished product at a very reasonable price. 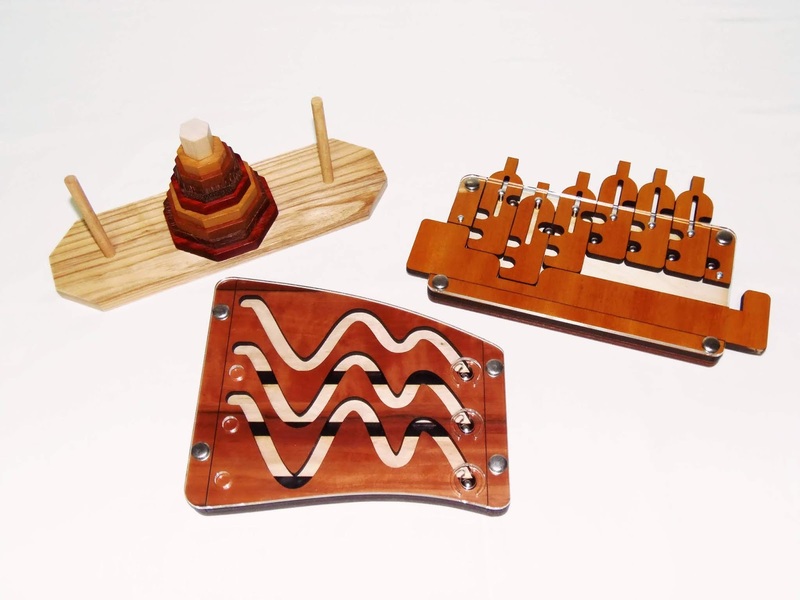 Another impressive aspect about Constantin's puzzles is the diversity of designs available. Today, the majority of puzzle designers only dare to make one type of puzzle, and will perfect that craft over the years - That's the rule. However, Jean Claude Constantin is the exception. 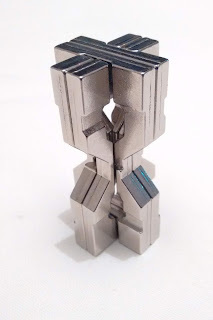 He can basically make any type of puzzle, from 2D/3D packing/assembly puzzles to sequential movement, wire/string, interlocking, puzzle boxes...you name it. And yet, each puzzle will be superbly made as if it were his first-ever design, having its own personality and special features. No matter what your collection focuses on, one thing is certain: Constantin has at least one puzzle that satisfies all your requirements. While most of Constantin's designs are made using plywood, he also has pretty interesting puzzles made from natural wood, like the Skyline, or the Eingeengt, or the Metalwurfel, or the Brochettes, just to name a few... As you can expect, these puzzles tend to be more expensive, but considering the materials used and their level of detail, they're still quite cheaper than many other renowned craftsmen's. Whether it's natural wood, or simply plywood, another important trait in Constantin's designs is the use of many different wood shades, sometimes combined with other materials such as metal. Since the colors are all natural and not painted, it results in a more beautiful and exquisite effect for all his puzzles. An example of this, seen in this rather simple design, the 1 x 9, nine different wood colors are being used for the pieces plus another one for the frame. 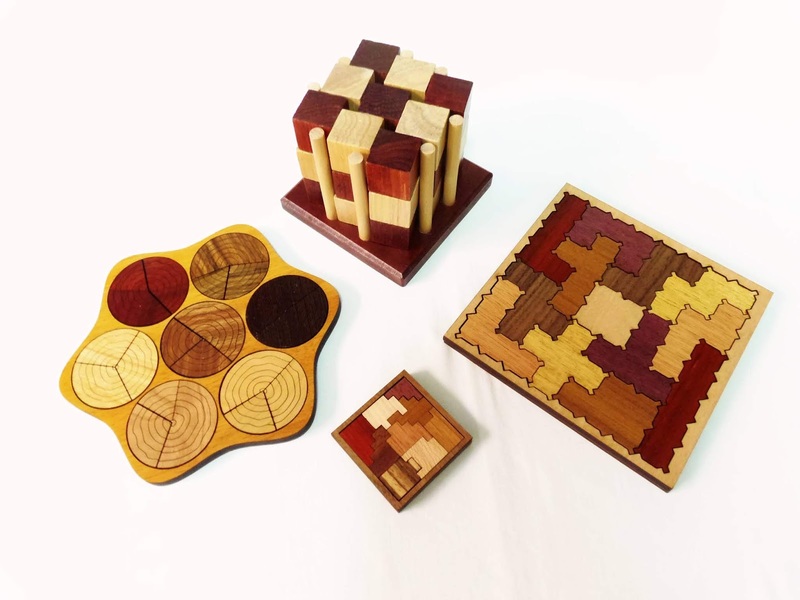 Two other gorgeous puzzles that make good use of this design philosophy are the Jahresringe and the Pentag Zigzag, both made from eight different wood colors (pieces plus frame). 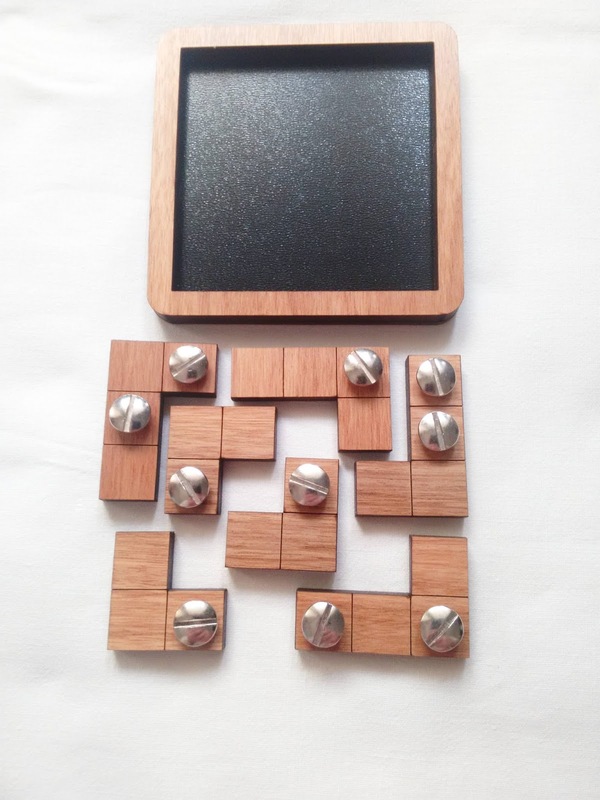 Even when a puzzle consists of just two wood tones, he chooses two highly contrasting colors for maximum effect, like the Tetris puzzle (seen below). Packing Puzzles are one of my favorite type of puzzles, and Constantin provides me with way more designs than I can handle, so it's always a difficult task having to choose a couple of them whenever I want to place a new order at a puzzle store. 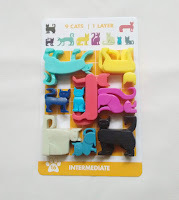 Having been collecting puzzles for over six years now doesn't give me the time (or money) necessary to own every single packing puzzle he makes, but I believe the ones I already have are sufficient to have, at least, scratched the surface. If Packing Puzzles are not your thing, not to worry... Constantin has something for everybody, and one of the most popular type of puzzles lately proves just that. I'm talking about n-ary puzzles, of course, the favorite subject of experienced puzzlers that demand harder challenges and beautiful designs to go with it. N-ary puzzles are sequential movement puzzles that require a recursive solution. Constantin is also an authority on puzzle boxes (also known as trick boxes), another soft spot of my collection and the subject of a few personal favorites. 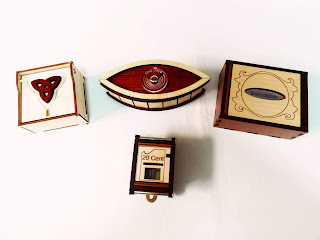 His designs are a bit different from the traditional Japanese Puzzle Boxes, but that doesn't mean they're not as impressive. Usually, his puzzle boxes are very well decorated and unlike their older cousins, only a couple of moves are necessary to open them. Mind you, a couple of very-difficult-to-figure-out moves. 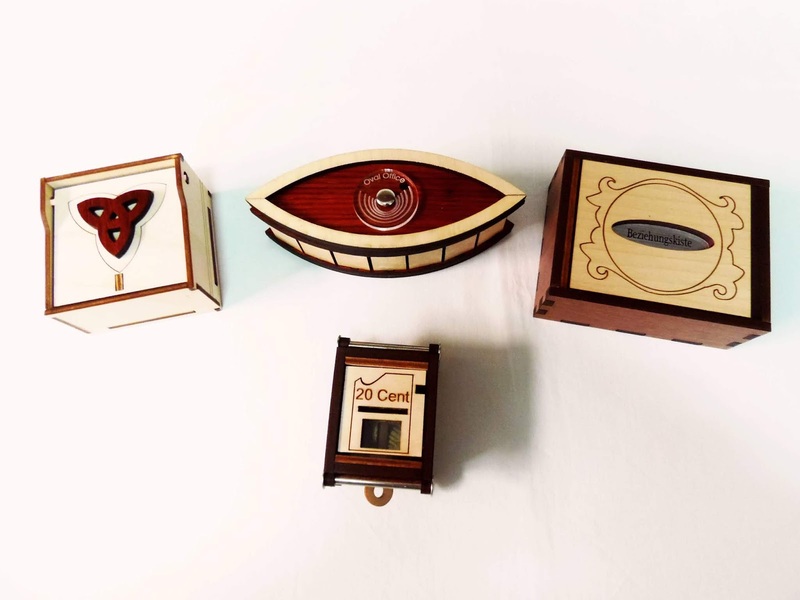 These boxes are considered as perfect gifts for puzzle enthusiasts, since you can always hide a surprise inside (money, jewelry, or other similarly sized objects) for when that person opens the box. Last, but not least, Trick Locks... 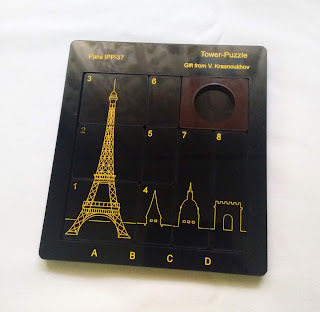 This is yet another fascinating type of puzzles that has a wide variety of designs and concepts, and there are people that devote entire collections exclusively for these puzzles. 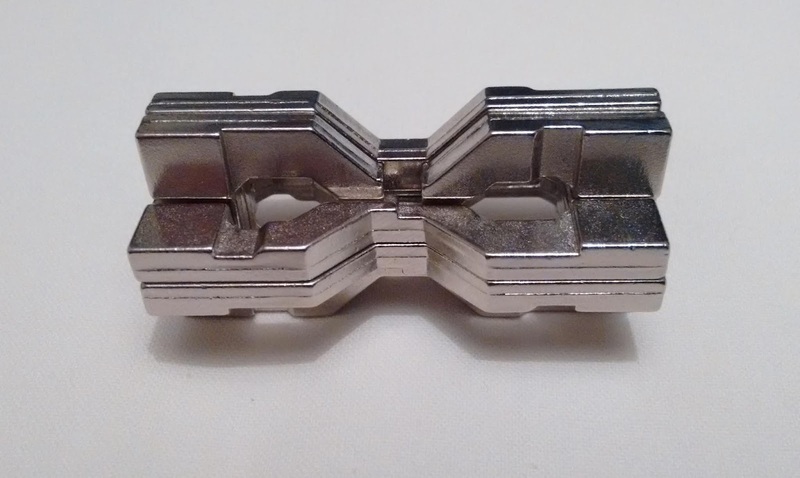 As expected, Constantin has a very important role on the design of some of the most impressive trick locks out there. Trick locks can have between two to hundreds of steps necessary to unlock them. Some have hidden mechanisms, where you need to use other senses besides your vision; most of them don't even need a key in order to be opened, while others need a more patient solver, since there are some locks that make a clever use of the n-ary concept, and Constantin seems to be an expert in this field. Whether you're a veteran puzzler or you're just venturing into this fantastic hobby, having a few Constantin puzzles will go a long way to enrich your collection. 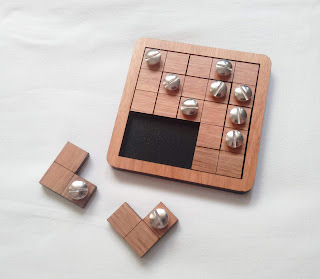 After seeing so many beautiful designs by this talented puzzle designer, I can truly say that there's nothing he can't do when it comes to wooden puzzles. What's mind-boggling is that he doesn't seem to be running out of ideas anytime soon, and for that I can hardly wait to see the next 70 or so new designs he has in store for us next year. Availability: You can find many of Constantin's puzzles at PuzzleMaster. It's been almost 40 years since the invention of the original Pyraminx by Uwe Meffert. 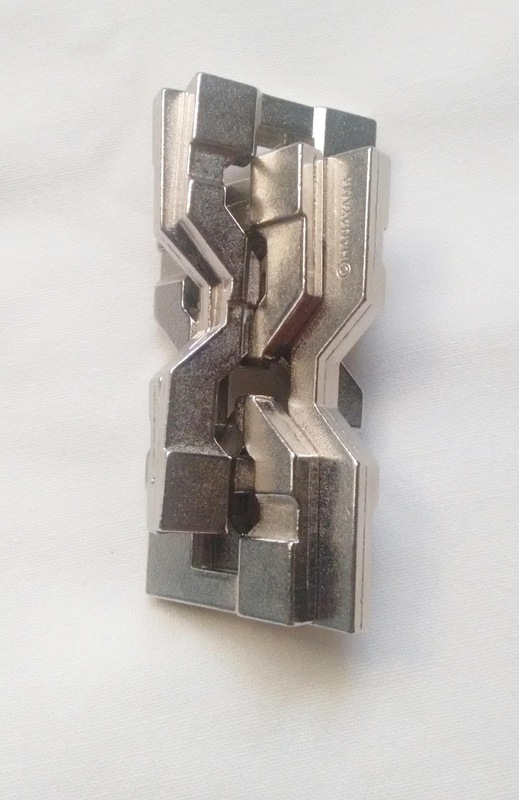 This puzzle not only inspired countless others designs, but it's still one of the best Twisty puzzles of all time. The Frame Pyraminx is one of the best-looking variations I've seen so far, but does it live up to the original design? This is a really cool design, made by Fangshi, which also produces many other Twisty puzzles. The body is entirely hollow, only supported by a 3x3 core, which by the way, glows in the dark. 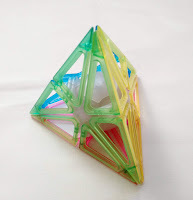 The frame is made by attaching two triangles perpendicularly. The material for the frame is made from this bright and colorful plastic, adding to the overall beautiful design. Contrary to what you'd expect, the Frame Pyraminx is an edge-turning puzzle, unlike its predecessor, which is a corner-turning. So, the solution will obviously be quite different if you're used to the original Pyraminx mechanism. I'd say the Frame Pyraminx's movement is a little more complex, so the difficulty is definitely higher. To really mix the puzzle you can't just turn it on its edges, or you'd never be able to fully scramble it. You need to align the edges in such a way so that the 3x3 core can turn on its axis. 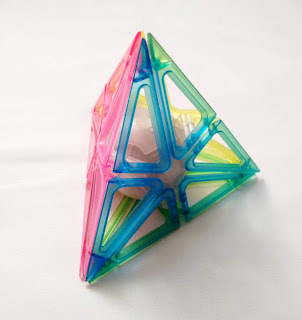 This creates patterns that you can't see in a normal Pyraminx, which is really interesting. Not bad for a variation. 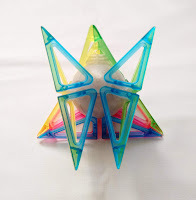 I can highly recommend the Frame Pyraminx to any Twisty puzzle fan. It was a novelty for me, in terms of movement, but also the design is really eye-catching and original. A real stunner. Availability: You can get your Frame Pyraminx at PuzzleMaster for $32.99 CAD. 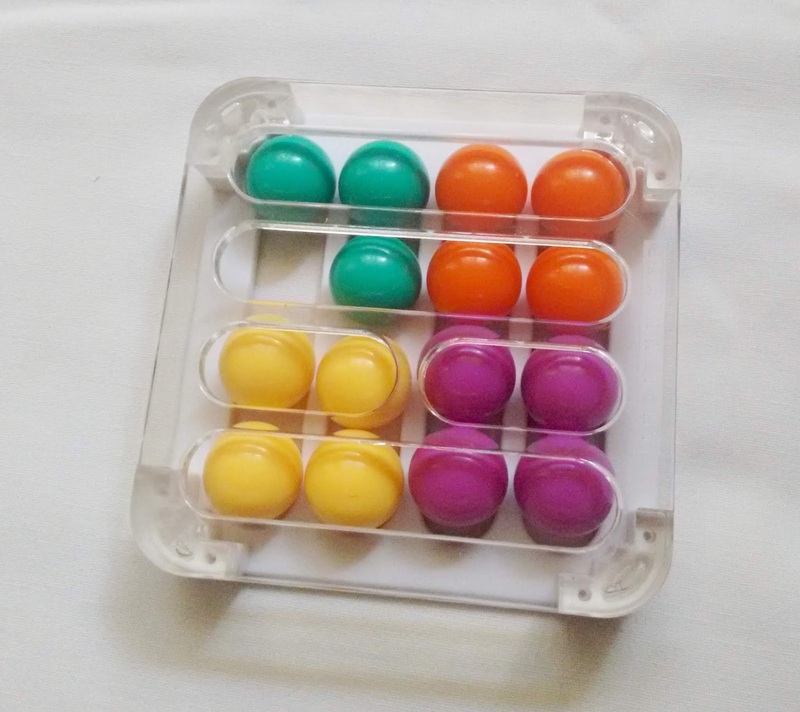 Check out other interesting puzzles by Fangshi. It's been a while since I've reviewed one of these Twisty puzzles. After all, I'm rubbish at solving them, but I really do like the variety of designs available, compared to when I started my collection over 10 years ago. The puzzle featured here is called Honey Copter and it's a real beauty. The puzzle is made by LanLan and it's a shape-mod variation of Oskar's Redi Cube. Each of the six faces features a four-leaf clover and you turn the puzzle not by rotating the faces but by rotating the corners. It makes a real cool effect. The colors are the 6 standard ones you see on most puzzles of this type (blue, red, yellow, white, orange and green). I couldn't comment of the difficulty since I won't dare shuffling it, unless I get a second copy to mess around. But judging by PuzzleMaster's classification of 8/10, I'd say that for an experienced puzzler, this won't be much of a challenge, but definitely a fun solve. The movement is smooth, but not speed-solving smooth. Then again, it's not like I'll be speed-solving it any time soon... I like almost everything about the puzzle, but the stickers are just a notch below what I'd consider good quality. They're already showing signs of peeling off from the edges, which is unfortunate. Other than that, it's a great looking puzzle. 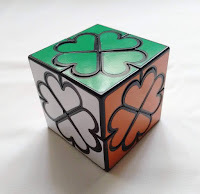 What more could you ask for: a Twisty puzzle with four-leaf clovers. Feeling lucky lately? 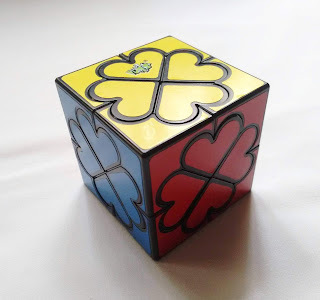 The Honey Copter is before anything else, a gorgeous design and one that surely be the delight of any collector, even if you don't plan on solving it. Availability: The Honey Copter is available at PuzzleMaster for just $23.99 CAD. Also, check out other puzzles by LanLan. The sands of time will torment you with the new Cast Puzzle, the Hourglass. There's no time limit for this hourglass, but will you solve it in a timely manner? 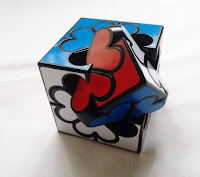 The new Cast Puzzle was designed by Korean JinHoo Ahn and was launched in September 2018. The elegant shape of the puzzle is what gives it its name, but don't let its beauty fool you, because this is a very difficult puzzle, rated as level 6/6. 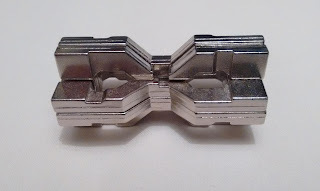 It's not the most difficult Hanayama puzzle, but it will certainly put your solving skills to the test. Once you take it apart, a harder challenge awaits you, as putting it back to its original shape is even more difficult. There are four interlocked pieces, which at close inspection revels two groups, each with identical pieces. The goal is to separate all four pieces, one by one. The puzzle is small and the details even smaller, so you need to pay close attention as to where the pieces connect with each other and where exactly is the exit point. Getting the pieces loose is not a difficult task. What's difficult is to find the correct sequence of movements that allows you to put the pieces where you want them. I found the puzzle a little confusing at first. I didn't know how to position the pieces for the next movement, so I had to use some trial and error until I felt I was close to the solution. Sometimes the expression "trial and error" is not very well received, since it's not logical thinking, but think of it this way: if you're trying to solve the puzzle for the first time, and you don't know how to solve it, you need to explore various routes and outcomes to see which ones point you in the right direction. This is not a puzzle to use logical thinking, it's more about dexterity and experimentation. Solution: If you get stuck, you can download the solution here. The Cast Hourglass may not be for everyone due to its level of difficulty, but if you like a serious challenge with little to no clues about how to solve it, then this is perfect for you. The design itself is already a good excuse to add it to your collection. Availability: You can get a copy of the Cast Hourglass at PuzzleMaster for $15.99 CAD. If you like Cast Puzzles, check out Hanayama's collection. Loyd's 15 is one of the most popular sliding puzzles of all time. Comprising 15 sliding tiles across a 4x4 grid, the missing "16th" number provided an empty space to move the tiles around the frame and solve the puzzle in a variety of solutions. Ever since its first introduction at the end of the 19th century, countless designs of the 15 Puzzle were created. One of such designs was made by Doug Engel, and I love its originality. 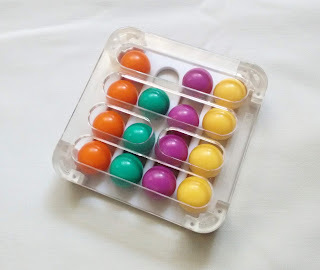 It's made by BrainWright and it's called The Block & Roll Puzzle, and instead of numbers, you'll be playing with colored marbles. So, how does this work? Is it just a simple exchange of numbers for colors? Well, not exactly. 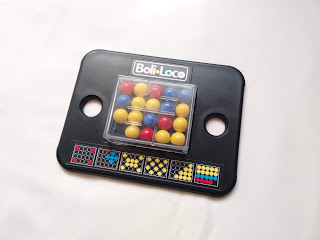 At first glance, there seems to be very few similarities between this puzzle and the classic version, besides the fact that you'll be sliding your way around a 4x4 grid. And indeed, the two puzzles couldn't be more different... and that's a good thing. 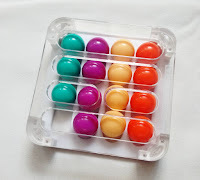 15 marbles make up the four groups of orange, yellow, purple and green colors. 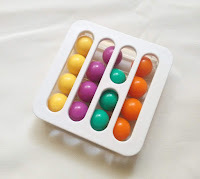 Unlike the original 15 Puzzle, here you'll be constrained by two barriers that will prevent you from freely navigate the marbles from one row to the other, just like a labyrinth. This is clearly seen in the photos, where two of the rows (one in the front and another in the back) have been cut in half and no marble can pass across it. This will, of course, raise the difficulty to a higher level than the original version. One thing that I always like about puzzles is the ability to create patterns or to have multiple solutions. 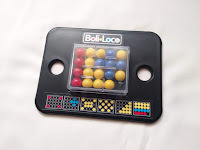 Here, The Block & Roll Puzzle does this in great style, as it offers you 44 different challenges with patterns to reproduce exactly as you see them. 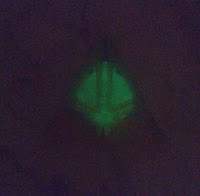 The challenges will be quite difficult, as the first two challenges seen in the photos took me around 30 minutes to solve. Not a bad thing, though, since I like a good challenge. Loyd's 15 The Block & Roll Puzzle is yet another great sliding puzzle that I'm happy to add to my collection. 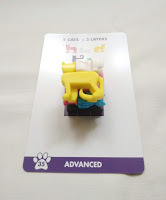 The concept is different from what I'm used to see in sliding puzzles, and the high difficulty will certainly test your patience and solving skills. Definitely recommended. Availability: The Block & Roll Puzzle can be found at PuzzleMaster for just $14.99 CAD. 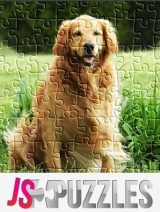 Check out other cool puzzles by BrainWright. Over the years I've come to really enjoy puzzles made by BrainWright. They always have these original designs that are quite fun to play with, but also rather challenging. And that's what I look for in a puzzle, really. 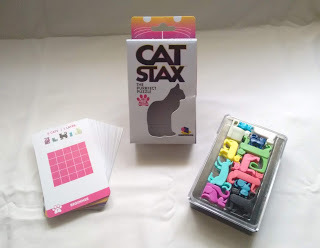 Cat Stax, created by Bob Ferron, is such a cute and nice puzzle that will delight cat lovers around the world. 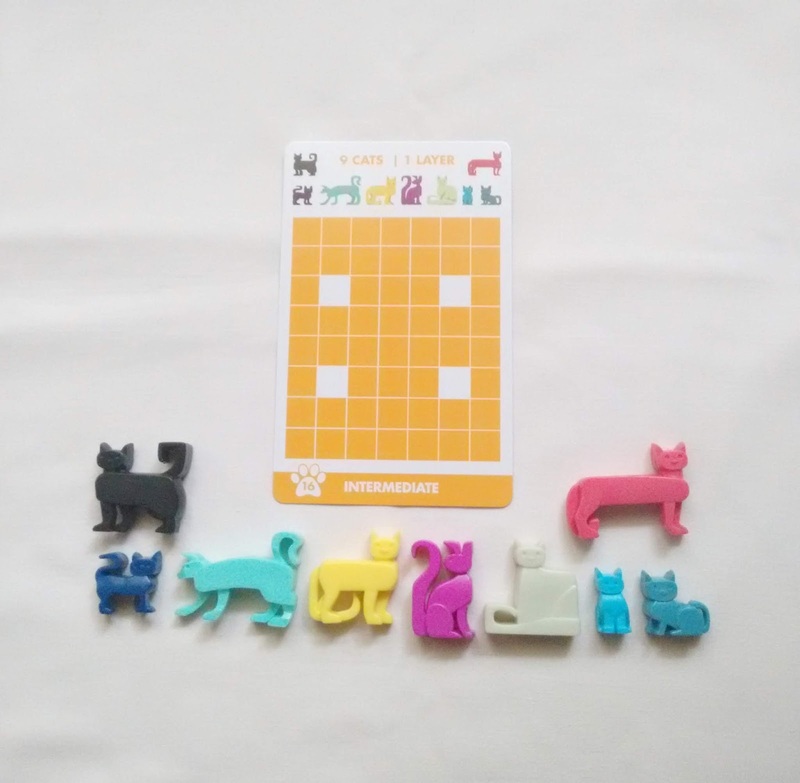 The puzzle comes in a travel-like package, which is light and small so you can take it with you to kill some time on a long trip. Inside, 12 different cats await for you to start playing with them. To get you started, 48 challenges divided in four difficult levels promise to keep you busy for quite a while. 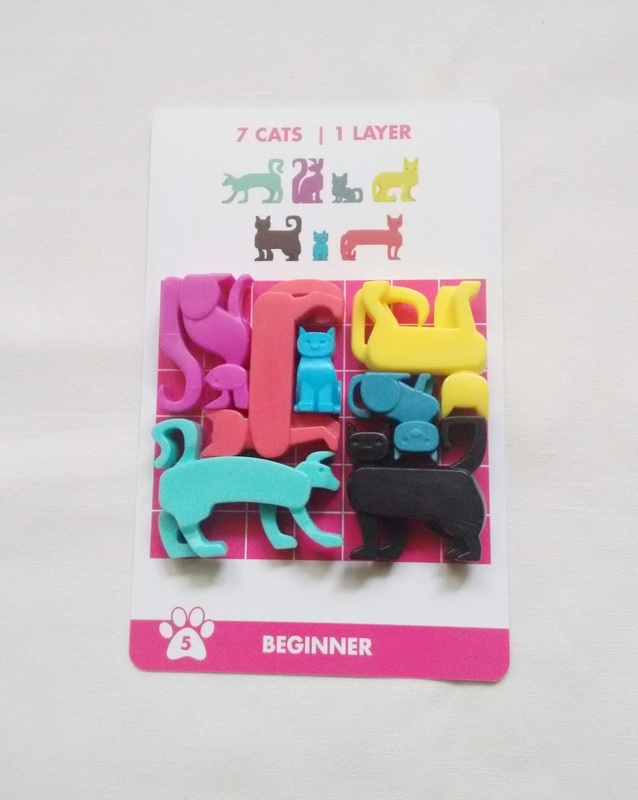 You can also put your creative skills to the test and create your own puzzles, since there are almost infinite combinations to stack and nest the cats in all sorts of arrangements. 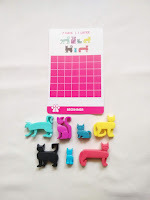 The goal is to choose a particular card and arrange the cats so they fit inside the grid provided in the challenge. You must nest the cats in a way so that they won't go outside the grid. 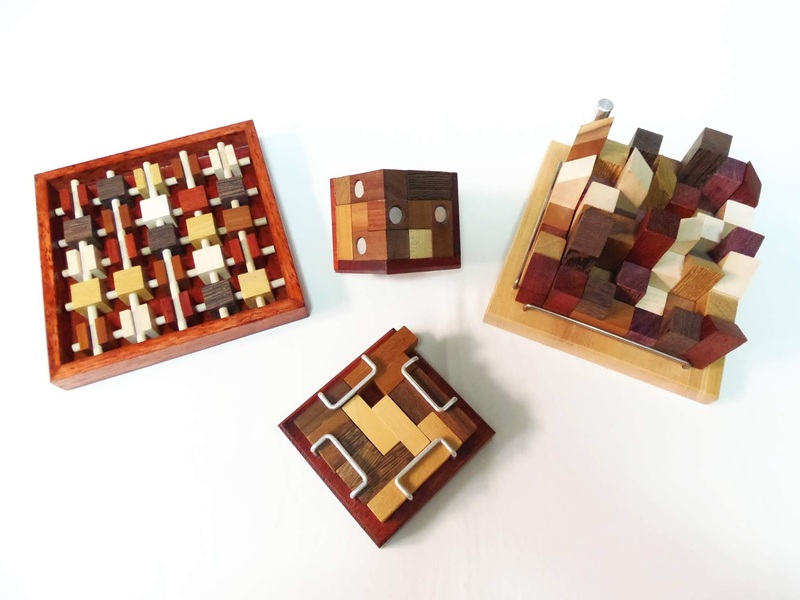 Depending on the challenge, you could be solving a 2D puzzle or a 3D puzzle. Each card will tell you how many layers a specific puzzle must have in order to be solved. As expected, the 3D puzzles are much harder and complex to solve than their 2D counterparts. Nevertheless, if you solve the puzzles in the correct sequence, they are introduced gradually in difficulty, so it's not like you're thrown an impossible challenge. Since I'm more of a fan of 2D puzzles, I naturally like them better, but I also had fun with the 3D challenges. The only drawback is that, because you don't have a box to place the pieces inside when solving a 3D challenge, it's much more difficult to visualize how to stack the cats together. Other than that, this is a great puzzle. Cat Stax is a really cleverly designed puzzle. 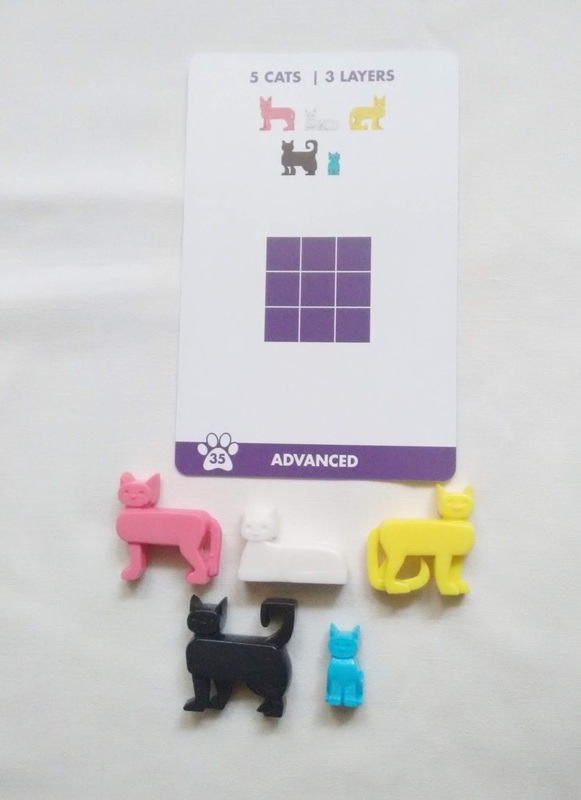 As a cat lover myself, I found it very entertaining and challenging enough for my solving skills. If you're not that fond of cats, don't despair, there's also a dog version and a farm animals version. 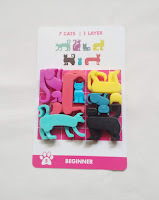 Availability: You can find the Cat Stax puzzle at PuzzleMaster for $21.99 CAD. Check out other puzzles by BrainWright as well. Ah, Sliding-Piece puzzles! My Kryptonite... Every time I can get my hands on one of these I feel like a kid again. This is the type of puzzle that I knew of way before starting my puzzle collection. They always fascinated me somehow. This is what Russian puzzle designer Vladimir Krasnoukhov came up with for the 37th IPP in Paris, France, in 2017. This is quite an original design for a slide puzzle, and I was excited to have a try. 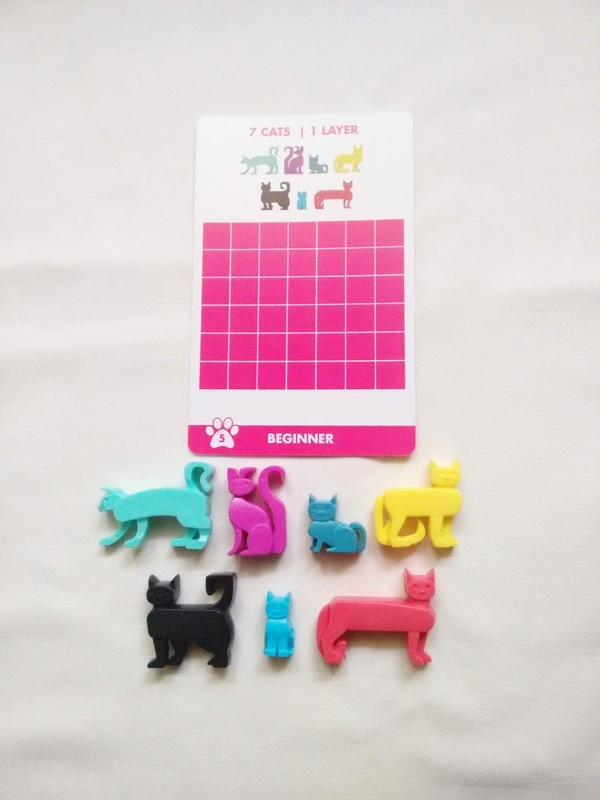 As you may know, the classic slide puzzle has an usual arrangement of 8 pieces laid in a 3x3 grid with an empty space so you can move the pieces around. 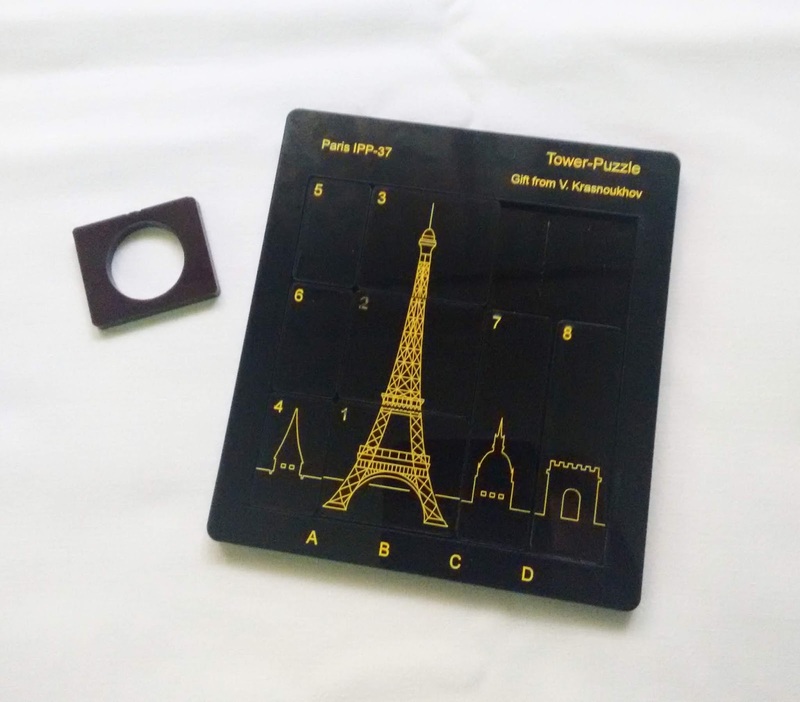 This time, you do have the same number of pieces, but instead of perfectly square tiles, the Tower Puzzle has three different sized pieces. And this is where it gets complicated. So, first of all, the design: I really love the design and overall look of the puzzle. 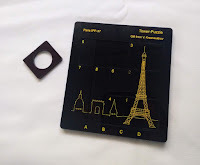 The dark color of the tiles contrasts beautifully with the yellow contours of the images of the Eiffel Tower and surrounding buildings. It looks like a nightscape where you only see the silhouettes and nothing else. Really stunning. It measures 10.1cm x 9.3cm (4" x 3.7"). Since the pieces are not the same size, you need a slightly different approach from the usual 3x3 sliding puzzles. But the idea is the same. Get the pieces from one location to the other. 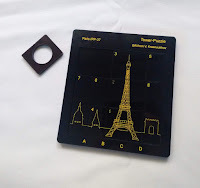 If one challenge wasn't enough already, you are given three different tasks, each one moving the Eiffel Tower farther away from its starting position. The first challenge is easy, with only 26 minimum moves. However, the third and most complicated challenge involves a total of 115 moves, so a lot of planning is necessary in order to solve it. I did find the last challenge a bit difficult, but nothing extraordinarily hard or frustrating. If you know how to solve sliding puzzles, you're pretty much in known territory and only a few minutes will separate you from the goal. Nevertheless, it's still great fun to solve it and I highly recommend it for sliding puzzle enthusiasts. 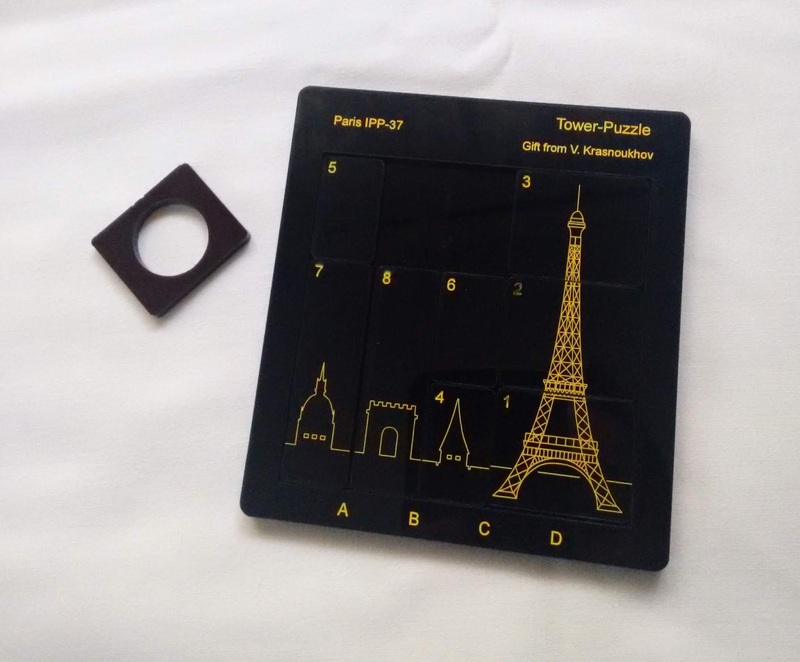 Availability: You can get a copy of the Tower Puzzle from PuzzleMaster for $26.99 CAD. Also, check out other great puzzles by Vladimir Krasnoukhov.